It’s obvious that Sharovipteryx was built to be a glider. But it’s the elongated, stick-like hind legs – rather than the barely visible fore legs – that acted like wings – and that’s enough to throw most of us for a loop. What gives here?? Everyone imagined a lack of pitch control in such a creature. To counter this pitch problem, Sharov (1971, Fig. 1) invented a membrane stretching from the back of the largely imagined arms to the front of the legs in a rather cartoonish presentation. Gans et al. (1987) observed no membrane between the front and hind legs. Even so, experiments with paper models (Fig. 1) showed that a canard membrane would have stabilized the animal in the air and extended its glide. 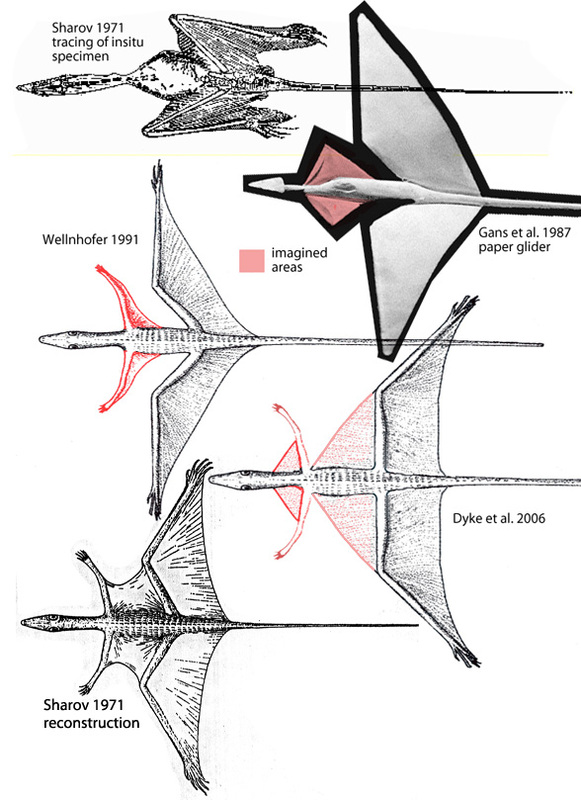 Wellnhofer (1991) simply re-illustrated what had been previously published, likewise imagining front limbs supporting a canard, but not connected to the hind limbs. Dyke et al. (2006) could find no membranes anterior to the hind legs, but imagined some that created a delta wing like certain aircraft. These authors also imagined a small delta canard wing anterior to the forelimbs for pitch control. As you can see, there has been no loss of imagination in trying to figure out the extent of the wing membranes in Sharovipteryx. Unfortunately, there has been an embarrassing lack of attention to detail. Figure 2. The wing membranes of Sharovipteryx. While others searched in vain for anterior membranes capable of controlling pitch in Sharovipteryx, I found them (Fig. 2), either by direct observation or phylogenetic bracketing. Two large hyoids (tongue bones) could have spread that loose preserved neck skin up to 6x their original width (3x per side, in pink, Fig. 2). This action would have created aerodynamic strakes, also found in modern jets like the F-18. Lifting and depressing the head, via the neck, would have elevated and depressed the strake, giving Sharovipteryx great pitch control. Both forelimbs are preserved virtually in their entirety. When recontructed they look stunted, but they were robust with traits also found in Longisquama and Cosesaurus like an expanded distal end and a large deltopectoral crest and parallel, appressed ulna and radius. These traits also include a tiny pteroid and preaxial carpal (Fig. 2. ), bones traditionally found only in pterosaurs, but also found in Cosesaurus (Peters 2009). Digit 4 was the longest (reaching to the pelvis in Sharov’s (1971) original illustration). Digit 5 was a vestige. Since sister taxa, Cosesaurus and Longsiquama had trailing edge membranes, phylogenetic bracketing permits us to add them to Sharovipteryx (Fig. 2). These would have acted like canards, small forewings capable of independent movement, but most typically extended straight out, supported by a robust scapula and coracoid. The sternal complex remains buried in Sharovipteryx, but phylogenetic bracketing indicates it had this fenestrasaur trait as well. A trait that has gone overlooked in prior reconstructions (Fig. 1) is how broad and flat the rib cage was. In dorsal view it formed a circular disc. This shape filled the area between the fore and hind limbs without the invention of a connecting membrane. A small stiff membrane anterior to the femur helped fill the gap otherwise present when the straight femur met the circular dorsal ribs. Another small stiff membrane appeared at the distal tibia. Between the toes membranes extended only as far as the proximal interphalangeal joints medially, further laterally, extending to ungual 4 lateral to digit 4. Aft of the hind legs, the patagia are well represented in the fossil. These fiber-embeded membranes extended to the second joint of digit 5 and to the second chevron on the tail. The elongated ilia, both fore and aft, would have supported wide thighs, at least proximally. 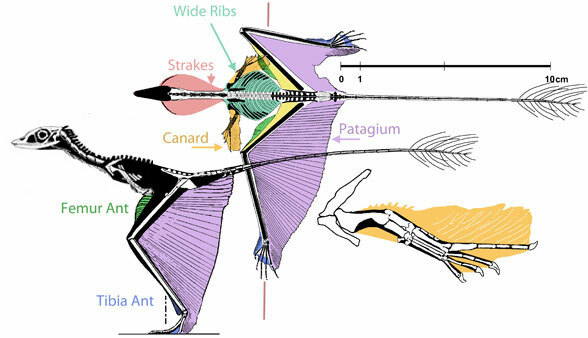 Far from lacking anterior pitch-control membranes, Sharovipteryx had both strakes and canards. Since the coracoids were elongated and stem-like, Sharovipteryx probably flapped its small forelimbs, generating a small amount of thrust. Primarily Sharovipteryx was a glider, and a well-controlled one! This obvious obligatory biped had to have been agile enough to land using its feet alone, as in birds. When approaching a landing spot, the anterior control surfaces would have been raised to stall the main flight membrane just prior to touch down. More on Sharovipteryx in the next two blogs: the hands and the skull. Dyke GJ, Nudds RL and Rayner JMV 2006. Flight of Sharovipteryx mirabilis: the world’s first delta-winged glider. Journal of Evolutionary Biology. Gans C, Darevski I and Tatarinov LP 1987. Sharovipteryx, a reptilian glider?Paleobiology, October 1987, v. 13, p. 415-426. Peters D 2000. A Redescription of Four Prolacertiform Genera and Implications for Pterosaur Phylogenesis. Rivista Italiana di Paleontologia e Stratigrafia 106 (3): 293–336. Sharov AG 1971. New flying reptiles from the Mesozoic of Kazakhstan and Kirghizia. – Transactions of the Paleontological Institute, Akademia Nauk, USSR, Moscow, 130: 104–113 [in Russian]. This entry was posted in Fenestrasauria, Sharovipteryx, Uncategorized and tagged fenestrasaur, Sharovipteryx by davidpeters1954. Bookmark the permalink.